In 1887, another "Alexander Sarcophagus" was unearthed at Sidon (now in Lebanon) and taken to Istanbul. Although its marble sides are decorated with images of Alexander in battle, scholars later determined that it was the coffin of a contemporary Phoenician named Abdalonymos.18 So the quest continued. The grave remains elusive to this day, even though at least eight announcements of its discovery have been made since 1800—all of them quite false, and some utterly fantastic. Alexander's tomb has been found in Alexandria, Siwah, Central Asia, and even a secret cave in southern Illinois. From the graveyard scene in Shakespeare's Hamlet (see chapter 2 below) to Hollywood's blockbuster Cleopatra (or the more lackluster 1989 movie The Serpent of Death), Alexander's whereabouts still fascinate us.19 According to popular Greek legend, sailors are still confronted at times by a Nereid who asks, "Where is the great Alexander?" Only one response will satisfy the dangerous creature: "Great Alexander lives and reigns! "20 The king remains a potent force in modern pop culture: for a mere $10,000 a night, the weary traveler can lounge in the Alexander the Great Suite at the Trump Taj Mahal Casino Resort in Atlantic City, New Jersey, perhaps wearing an Alexander the Great World Tour 336-323 b.c. T-shirt (listing major stops in the king's campaigns), sipping an Alexander the Great cocktail, listening to Iron Maiden sing about the youth who "became a legend 'mongst mortal men," and reading about him in Anne Rice's Servant of the Bones.21 At this moment, several new movies and miniseries are in production to meet the public's insatiable appetite for legends of the Macedonian conqueror. While the rest of us wait impatiently for our fifteen minutes of fame, Alexander has already enjoyed his share 82 million times over. Everything about Alexander evoked awe among his contemporaries and still does so today. In the past forty years alone, experts have published more than 2,000 books and articles in a painstaking effort to solve the fundamental puzzles of his life. There we read that Alexander personally dreamed up the lofty ideal of world brotherhood and paved the way for universal religions of peace and love. We learn, too, that he conquered and killed with epic abandon, unable to sate his lust for innocent blood. He exhibited the noblest virtues of friendship and chivalry, and he butchered his closest companions out of raging insecurities. He was enlightened, intelligent, and temperate; he was insane and addicted to violence and alcohol. These studied portraits of Alexander as both a sensitive youth and a psychopath could not be more controversial and contradictory. Modern scholars did not, of course, invent this mystery. We have simply inherited the problem from many generations of writers, going all the way back to the fourth century b.c.e. Even then, Alexander emerged upon the world stage, it might have seemed, from the smoke and mirrors of a magician's trick. With all eyes fixed upon the dazzling reign of his father, King Philip II, no one expected the young Alexander to so upstage his sire. Through war and diplomacy, Philip made himself a difficult act to follow.22 In 359 b.c.e., Philip had taken the throne of a kingdom in disarray. Macedonia had lost nine monarchs in forty years, at least five of them to assassination, and the latest—Philip's older brother Perdiccas III—to a devastating invasion. Macedonia was a tough place that bred a tough population. To survive in the midst of so many enemies on the northern fringes of the Greek world, the Macedonians held fast to the heroic warrior code of Homer's Iliad and Odyssey. They seemed a time warp back to the Trojan War and the bellicose Bronze Age. In battles, brawls, and drinking bouts, the Macedonians measured a man from king to commoner by the implacable standards of Achilles and Agamemnon. Risks ran high among such aggressive egos, and no offense passed unanswered. Even kings could not afford a slip in the company of such warriors; hesitation or error meant speedy elimination. Philip thus led his troops with conspicuous bravado, enduring horrendous battle injuries to his face, arm, collarbone, and leg that left him half-blind and hobbling the rest of his life.23 These were the legitimizing wounds of a warrior king. That dramatic moment arrived, appropriately enough, when his father strode at the height of his glory into a crowded theater. In 336 b.c.e., Philip had assembled dignitaries from all over Greece to witness the wedding of his daughter and launch the long-awaited invasion of Persia with lavish fanfare. Then, without warning, Philip fell dead before the throng—the victim of an assassin's dagger.27 His son Alexander, barely out of his teens, was hauled from the shadows and hailed the new king of Macedonia. It was an impressive entrance in the opening act of a show that has no equal in history. From that theater, when the dust had cleared, Alexander would guide men as much as three times his age on an epic march that made him master of an unprecedented empire stretching from Olympus to India. Every part of that story is a mystery. Exceeding everything ever expected of Philip, Alexander seemed invincible. He came ashore in Asia Minor wearing full ceremonial armor and symbolically cast a spear into the beach to claim the East by right of conquest. At the Granicus River (334), a regional Persian army reinforced with Greek mercenaries tried to stop Alexander's relatively small force. The young king, still earning his throne, was nearly killed in a brash charge into the enemy's lines. But his companions rallied to the cause, crushed the Persian cavalry, and slaughtered the mercenaries. This first victory awakened the Greek and Persian worlds to Alexander's potential for greatness; but, given the many factions that so badly wanted him to fail, every such military engagement had to be a make-or-break triumph. He could not lose and live to fight another day. He had embarked upon a career of conquest so circumscribed by foreign and domestic dangers that it demanded absolute perfection—a statesman's nightmare, a general's torment, a mortal's impossibility. Only a steely survivor of the Macedonian court, with its daily tests of nerve and talent, could stand these pressures and believe so completely in his own star. From the Granicus River, Alexander turned south to take the Ionian Greek coastal cities of Asia Minor. He faced strong resistance at Miletus and Halicarnassus, but Macedonian siegecraft eventually won the day. Along the march, two highly publicized incidents took place that were embellished to manifest Alexander's unique standing among men and gods. Along the beaches beneath Mt. Climax, the king and his entourage suddenly found themselves blocked by menacing waves crashing across their path. Then, just as quickly, the waters calmed and fell back, as though bowing before Alexander—an apparent sign of his divine power and protection. Later, as the army wintered inland at Gordium, Alexander allegedly solved the intractable problem of the Gordian Knot. By cutting (or unraveling) the rope that held a yoke to the legendary wagon of Gordius, Alexander fulfilled an ancient prophecy that guaranteed divine favor. At the same moment, a display of thunder and lightning signaled Zeus's support for Alexander's drive to conquer Persia. Alexander next pushed his way into the heartland of the Persian Empire, where Darius waited again with a gigantic army. At Gaugamela (331), Alexander miraculously defeated his enemy in a battle that decided the course of Middle Eastern history. Darius escaped the debacle, but his fate was sealed: his own commanders killed him the following year. From the plundered treasuries of Persia, Alexander hauled away on the backs of 20,000 mules and 5,000 camels more wealth than the Greek world had ever known, amounting to twelve million pounds of silver.30 More than human, more than rich, Alexander already ruled the equivalent of ten modern nations (Greece, Turkey, Syria, Lebanon, Israel, Jordan, Egypt, Kuwait, Iran, and Iraq) plus parts of several others. But this was only the beginning. Never satisfied, Alexander set his sights upon Central and South Asia. From 329 to 327 b.c.e., he campaigned against the obstinate forces of Bactria and Sogdiana, in the tortuous mountains and deserts of present-day Afghanistan, Turkmenistan, Uzbekistan, and Tajikistan.31 At first, the enemy rallied around a kinsman of Darius named Bessus, formerly the satrap (governor) of Bactria but now claiming the throne of Persia as King Artaxerxes. Alexander countered such claims by right of conquest, and hunted Bessus down as a regicide and usurper. After Bessus had been betrayed by his Bactrian followers, Alexander had him tortured and executed according to Persian custom.32 Soon afterward, in response to Macedonian military settlements that threatened the traditional politics, economy, and culture of Bactria and its environs, fresh resistance stirred under the able leadership of a native named Spitamenes. The situation turned catastrophic. Alexander's troops began to tire, and the complaints of some of his closest companions created new tensions that sometimes led to executions. Alexander pressed on through three hard years of guerrilla fighting. Sandstorms and searing heat claimed the lives of thousands; in winter, blizzards literally froze the Macedonians in their tracks. When provisions ran out, the army ate its own baggage animals—sometimes raw. Led by Spitamenes and other tribal chiefs, the enemy used the harsh climate and terrain as a lethal weapon, controlling mountain passes and strongholds to cut off supplies and stage quick but effective ambushes; whenever the Macedonians rallied, the insurgents disappeared into the desert or mountains. As one ancient writer described it, waging war in Bactria was like trying to slay the mythical Hydra—every time one head was severed, others arose in its place.33 Accepting the challenge, Alexander raided the river valleys, scorched the earth, and sealed off the region with a series of stronger military colonies. The struggle became exceptionally vicious, but the Macedonians persisted. How Alexander drove his men through such hardships is still a mystery of military science, a lesson somehow lost upon the superpowers of the nineteenth and twentieth centuries that dared invade Afghanistan, with tragic consequences. It is yet too soon to know whether the twenty-first century will witness the same result. In his turn, Spitamenes fell victim to the perfidy of the Bactrians and their allies, who delivered their commander's head to Alexander's camp. This, plus the timely diplomatic marriage of Alexander to Roxane, the daughter of another local chieftain, made it possible for the Macedonians—minus an unhappy occupation force of 13,500 troops—to declare victory and leave Bactria behind. It had taken nearly as long to pacify this one province as all the rest of the Persian Empire, and the casualties had never been higher. The strain of these wars erupted from time to time along new fault lines in Macedonia's traditional institutions. Alexander's growing autocracy rankled some senior officers, and even the common soldiers must have struggled with the king's new standing among the gods and his willingness to adopt Persian dress and court practices such as proskynesis (ritual obeisance). Plots and protests signaled disaffection, but royal retribution came swiftly. Some very prominent individuals (Philotas, Parmenion, Cleitus, Callisthenes) lost Alexander's favor and their lives. Alexander, not yet thirty, next led his army across the Hindu Kush mountains and plunged across what is now Pakistan into the monsoons of India.34 In the midst of so much misery, more than 3,000 miles from home, Alexander's army fought one of its fiercest battles against a resourceful rajah whom they called Porus. In this battle of the Hydaspes River (326 b.c.e. ), Porus deployed a dangerous weapon against the invading Greeks: a terrifying corps of trained war elephants, the panzers of antiquity.35 Alexander outmaneuvered the Indians, crossed the river under the cloak of heavy rain and darkness, and drove straight at Porus's army during a fierce dawn attack. It was a fight the Macedonians would never forget, with elephants trumpeting and trampling in a wild melee. Porus was wounded, defeated, captured, pardoned, and put back on his throne in a unique display of admiration for a worthy adversary. Victorious, Alexander continued his march east, toward what Aristotle had promised were the ends of the inhabited earth. But the king found a different outcome instead, on the banks of the Hyphasis River, where his exhausted army balked at further conquest and put a stop to his search for the world's edge. The men rejoiced at the thought of returning home to enjoy the loot of their labors. Had they known how long that journey would be, and how many of them would never see Greece again, the celebrations might have been aborted altogether. Frustrated by the first major failure of his life, Alexander turned back and built a fleet near the site of his victory over Porus. When the monsoon abated, he steered his forces down the Indus Valley and cut a swath to the Indian Ocean. The fighting belied all hopes of a leisurely march home. In the assault on one town among the Malli, Alexander noted such lassitude among his troops that he shamed them into action by mounting the enemy's walls and leaping inside all but alone. This startling action invigorated the attack and doomed the town, but not before Alexander fell with a serious wound, from which he barely recovered. Meanwhile, in what turned out to be the last months of his life, Alexander wrestled with the enormous problems of his new empire, while planning boldly for further conquests. The solution to every crisis seemed to provoke another. For instance, the king's so-called Exiles' Decree attempted to rid the empire of a dangerous surplus of homeless mercenaries by allowing them to return to their native cities in Greece. But these soldiers were not wanted back in the places from which they had originally been banished. Angry cities such as Athens saw this act as another example of Alexander's abusive autocracy and threatened to revolt. Resentment still simmered in his own army whenever the king's measures seemed to undermine Macedonian tradition. At Susa, for example, Alexander arranged marriages between important Persian noblewomen and nearly one hundred of his senior officers; the king took two more brides himself. This may have been done to neutralize the power of these women should they wed the wrong people. Nonetheless, this appeared to elevate the status of the enemy and to portend a mixed race that would inherit what ought to be purely Macedonian. The attitude of the Macedonians to these marriages may be gauged by the fact that all (save one) were repudiated as soon as Alexander died. We cannot guess what happened to all of these spurned women, or to the many thousands of camp followers whom the rank and file were forced to marry at the same ceremonies. Another crisis arose when Alexander unveiled a corps of 30,000 young men recruited from Bactria and Sogdiana, trained in the Macedonian manner and given the alarming title of Epigoni ("Successors"). His offer to settle the financial affairs of his veterans and later to send many of them back to Macedonia—once their fondest hope at the Hyphasis River—now aroused fear and resentment. This time, in a mutiny at Opis, the men complained that they were being put out to pasture, while Persians stood ready to replace them. The ringleaders of this sedition were arrested and executed, after which a massive feast of reconciliation calmed—or cowed—the army. Ten thousand were to go home, and a fresh levy of Macedonians was to take their place in an Arabian campaign. It would never begin. At Babylon, Alexander fell ill and slowly lost his last battle against an uncertain disease.37 On June 10, 323 b.c.e., he died mysteriously at the age of thirty-two. As suddenly as he had appeared, Alexander vanished again behind the smoke and mirrors of hatred, hype, and hero-worship. Alexander was incomprehensible to his contemporaries twenty-three centuries ago, unfathomable to eighty-five generations of poets, priests, and politicians in Rome and the Middle Ages, and he remains inscrutable today. What confounds us now is not simply the man's military genius or the magnitude of his achievements, but the surprisingly pitiful state of our evidence about him. The details of his personality and career must be reconstructed on the basis of second- and third-hand accounts; his own records, as well as the many eyewitness histories written by his contemporaries, have all been lost. The earliest available narrative about Alexander's reign was composed 300 years after he died; the best was written nearly two centuries after that. In a worst-case scenario, things can go horribly wrong with such different kinds of sources. Consider, for example, the question of what transpired between Alexander and Porus in India. At the dawn of the twelfth century, the Benedictine monk Ekkehard puzzled over this problem while writing a history of the world (Chronicon Universale). Ekkehard, later the abbot of Aura in Bavaria, had traveled to the Holy Land and enjoyed a fine grasp of the sources then available for ancient history. His Latin compilation was one of the first to call attention to some glaring contradictions in that record. In the Historia de preliis, derived from a tenth-century translation of the Greek Alexander Romance, Ekkehard read (78-79) a haughty exchange of letters between Alexander and Porus not to be found in the historical tradition known best to him through the narratives of Curtius and Justin.39 Ekkehard found reports (80) that Porus commanded 14,800 scythed chariots and 400 elephants, each beast carrying a tower filled with thirty armed men. Alexander defeated this army and captured Porus's exotic palace (80-81); later, Alexander killed Porus in a David-and-Goliath duel (89). This troubling version could scarcely be reconciled with the famous account of Porus's pardon and subsequent partnership with Alexander. Furthermore, in the Epistola ad Aristotelem (Letter to Aristotle) drawn likewise from the Greek Alexander Romance, Ekkehard had to deal with another story.40 In this case, Alexander disguised himself as a common soldier and infiltrated Porus's camp. Alexander tricked Porus into believing his royal opponent would be an old and indolent Macedonian. This whole episode ended in Porus's defeat, but the rajah was spared and allowed to reign as the Macedonian's vassal. What was Ekkehard to make of such dissonantia hystoriographorum (discordance of historiographies)? Did Alexander kill Porus or capture and reinstate him? Were the royal letters genuine? Was it possible that Porus's army amounted to so many chariots and elephants? Could Alexander have been a clever spy? Complicating matters, other medieval writers treated these stories as Christian allegories, in which Alexander appeared as Christ and Porus as Satan.41 Ekkehard warily (or wearily?) chose the Herodotean path, setting forth the contradictory tales and inviting his readers to judge between them. Scholars have wrangled for centuries over the relative merits of these sources, working backward from the five surviving narrative histories (usually discounting the Romance) to make useful postulations about those that have disappeared. The idea is to peel back the layers of later prejudice and error in order to reach back to the fragmentary eyewitness accounts. We then infer the past based upon these reconstructed texts. This tedious process cannot be avoided, since historians depend entirely upon their sources: they study evidence, not events. Short of time travel, the past no longer exists for direct observation. Like those who investigate other singular (rather than recurring) phenomena, such as human evolution or the extinction of dinosaurs, the emphasis in training and research must be on the surviving evidence and how it should be processed into reliable theories about what can no longer be seen. This holds true, of course, for both literary and material evidence. Artifacts, whether dinosaur bones or ancient coins, require the same careful analysis as Arrian's secondary Greek history of Alexander. Of course, we are more likely to discover objects rather than texts that are contemporary with Alexander, so our quest for firsthand evidence naturally excites us about archaeology's potential to put us in more direct contact with the past. Yet we have already seen how difficult and disappointing this prospect can be: Alexander's tomb has tricked us time and time again, our certainties always giving way to doubts the deeper we dig through the layers of evidence. What we can touch or read may not be what it seems. We must ask: how did this text or artifact arrive at this place in this form? Has it been altered along the way? Has it fallen under the power of privileged assumptions that have yet to be noticed and tested? Much of the literature devoted to Alexander studies has dealt with these issues. We have thus, for example, had the benefit in recent years of entire books devoted to Curtius and his sources and to the mosaic found at Pompeii depicting Alexander's battle against Darius.45 Every scrap of literary and material evidence deserves this level of intense scrutiny, because the subject is so important and the sources are so few. The chapters to follow undertake such an investigation of one of the most mysterious artifacts ever associated with Alexander the Great and seek to shed light on where, how, when, and why it was made, and what this might tell us about Alexander himself. To reach those conclusions, however, it is necessary to follow the trail of evidence every step of the way. How did it come to be in its unusual place of discovery? By what means did it come into the possession of historians, and what assumptions shaped their evolving theories about it? We can track the growing controversy surrounding this object, and related finds, right up to the present, resolving the mystery and offering an extraordinary glimpse into the psyche of Alexander the Great. 1. Alexander was not, as far as we know, called "Alexander the Great" in his lifetime; the sobriquet was conferred upon him by Romans around 200 b.c.e. See Plautus Mostellaria 3.2.775. 2. Recommended biographies include Peter Green, Alexander of Macedon, 356-323 b.c. (Berkeley: University of California Press, 1991), and A.B. Bosworth, Conquest and Empire: The Reign of Alexander the Great (Cambridge: Cambridge University Press, 1988). Lively but less detailed treatments include Michael Wood, In the Footsteps of Alexander the Great (Berkeley: University of California Press, 1997), Pierre Briant, Alexander the Great: Man of Action, Man of Spirit (New York: Abrams, 1996), and Richard Stoneman, Alexander the Great (New York: Routledge, 1997). 3. Augustine City of God 4.4; Dante Inferno 12.107. 4. Jacob Abbott, The History of Alexander the Great (New York: Harper & Brothers, 1848), pp. 208-9. 5. The Standard Edition of the Complete Psychological Works of Sigmund Freud, ed. James Strachey, vol. 6: The Psychopathology of Everyday Life  (New York: Norton, 1976), pp. 107-9. See also S.L. Warner, "Freud the Mighty Warrior," Journal of the American Academy of Psychoanalysis 19, 2 (1991): 282-93. Later in life, Freud most envied the adventurous career of Heinrich Schliemann; see Peter Gay, Freud: A Life for Our Time (New York: Norton, 1988), p. 172. 6. Jefferson to Langdon, dated March 5, 1810: see Saul Padover, ed., A Jefferson Profile (New York: John Day, 1956), pp. 190-194. 7. Michael Meyer, The Alexander Complex (New York: Times Books, 1989), p. 4. 8. Plutarch Caesar 11.3; Suetonius Caesar 7.1; Dio 37.52.2. See Peter Green, "Caesar and Alexander: Aemulatio, imitatio, comparatio," American Journal of Ancient History 3 (1978): 1-26. 9. Appian Mithridatic Wars 117. On Alexander in Roman literature, politics, and art, see the essays in Jesper Carlsen et al., eds., Alexander the Great: Reality and Myth (Rome: "L'Erma" di Bretschneider, 1993); Gerhard Wirth, "Alexander und Rom," in Alexandre le Grand: Image et réalité (Geneva: Fondation Hardt, 1976), ed. Ernst Badian, pp. 181-221; Margarete Bieber, Alexander the Great in Greek and Roman Art (Chicago: Argonaut, 1964), pp. 68-81. 10. Dio 51.16.5; cf. Suetonius Aug. 18.1. Suetonius Aug. 50 also reports that the emperor put Alexander's portrait on his signet ring. 12. Scriptores Historiae Augustae Tyranni triginta 14.2-6. 13. Chrysostom Ad illuminando catechesis 2.5. 14. Adrian de Longpérier, "Trésor de Tarse," Revue Numismatique 13 (1868): 309-36; cf. Cornelius Vermeule, "Alexander the Great, the Emperor Severus Alexander and the Aboukir Medallions," Revue suisse de numismatique 61 (1982): 61-72, esp. p. 62. 15. Thomas Hoving, Making the Mummies Dance (New York: Simon & Schuster, 1993), pp. 118-19. 16. Edward Clarke, The Tomb of Alexander: A Dissertation on the Sarcophagus Brought from Alexandria and Now in the British Museum (Cambridge: Cambridge University Press, 1805). 17. Achille Adriani, La tomba di Alessandro: Realità, ipotesi e fantasie (Rome: "L'Erma" di Bretschneider, 2000). Some believe that Alexander was truly buried in this "borrowed" sarcophagus: see Andrew Chugg, "The Sarcophagus of Alexander the Great," Greece and Rome 49, 1 (2002): 18-26. 18. On the Sidonian Sarcophagus, see O. Hamdy Bey and T. Reinach, Une nécropole royale à Sidon (Paris: Leroux, 1892). The indispensable reference for all such discoveries is now Andrew Stewart, Faces of Power: Alexander's Image and Hellenistic Politics (Berkeley: University of California Press, 1993). 19. Cecil B. DeMille's Cleopatra (1934) starred Claudette Colbert in the title role; Joseph Mankiewicz's film of the same name (1963) featured Elizabeth Taylor. The Serpent of Death (1989) was directed by Anwar Kawadri. For further details, see Frank Holt, "Dead Kings Are Hard to Find," Saudi Aramco World 52, 3 (2001): 10-11; id., "The Missing Mummy of Alexander the Great," Archaeology 39 (January/February 1986): 80. See also Racine's tragedy Alexandre le Grand. 20. On such modern folktales, see Martha Payne, "Alexander the Great: Myth, the Polis, and Afterward," in Myth and the Polis, ed. Dora Pozzi and John Wickersham, pp. 164-181 (Ithaca, N.Y.: Cornell University Press, 1991). 21. I thank the management of the Trump Taj Mahal for information about the suite. The T-shirts are sold on eBay; an Alexander the Great cocktail is made with vodka, cream, coffee liqueur, and crème de cacao; Iron Maiden's Somewhere in Time album includes a song titled "Alexander the Great"; and he appears briefly in Rice's Servant of the Bones (New York: Knopf, 1996), pp. 170-71, 262-63. 22. On the reign of King Philip II, consult the following representative works: E.N. Borza, In the Shadow of Olympus: The Emergence of Macedon (Princeton: Princeton University Press, 1990); N.G.L. Hammond, Philip of Macedon (Baltimore: Johns Hopkins University Press, 1994); N.G.L. Hammond and G.T. Griffith, A History of Macedonia, vol. 2 (Oxford: Clarendon Press, 1979); George Cawkwell, Philip of Macedon (London: Faber & Faber, 1978); and J.R. Ellis, Philip II and Macedonian Imperialism (Princeton: Princeton University Press, 1976). 23. Consult Alice Riginos, "The Wounding of Philip II of Macedon: Fact and Fabrication," Journal of Hellenic Studies 114 (1994): 103-19. 24. The standard reference is now Elizabeth Carney, Women and Monarchy in Macedonia (Norman: University of Oklahoma Press, 2000). 25. Pierre Briant, Histoire de l'empire perse de Cyrus à Alexandre, 2 vols. (Leiden: Nederlands Instituut voor het Nabije Oosten, 1996). 26. J.R. Hamilton, "Alexander's Early Life," Greece and Rome 12 (1965): 117-24. Our knowledge of Alexander's youth rests largely upon the anecdotal account in Plutarch Alex. 1-10. 27. The dramatic scene is best described in Diodorus 16.92-95. Interesting modern investigations of the event include Ernst Badian, "The Death of Philip II," Phoenix 17 (1963): 244-50; R.D. Develin, "The Murder of Philip II," Antichthon 15 (1981): 86-99; J.R. Fears, "Pausanias, the Assassin of Philip II," Athenaeum 53 (1975): 111-35; N.G.L. Hammond, "The End of Philip," in Philip of Macedon, ed. M. Hatzopoulos and L. Loukopoulos, pp. 166-75 (Athens: Ekdotike Athenon, 1980); and J.R. Ellis, "The Assassination of Philip II," in Ancient Macedonian Studies in Honor of Charles F. Edson, ed. H.J. Dell, pp. 99-137 (Thessaloniki: Institute for Balkan Studies, 1981). 28. The military aspects of Alexander's career are the focus of several useful works: J.F.C. Fuller, The Generalship of Alexander the Great (New Brunswick, N.J.: Rutgers University Press, 1960); N.G.L. Hammond, Alexander the Great: King, Commander and Statesman, 2d ed. (Park Ridge, N.J.: Noyes Press, 1989); E.W. Marsden, The Campaign of Gaugamela (Liverpool: Liverpool University Press, 1964); and Donald Engels, Alexander the Great and the Logistics of the Macedonian Army (Berkeley: University of California Press, 1978). On Alexander's Persian opponent, Darius III, see Carl Nylander, "Darius III—the Coward King: Point and Counterpoint," in Alexander the Great, ed. Carlsen et al., pp. 145-59. 29. Ernst Badian, "The Deification of Alexander the Great," in Ancient Macedonian Studies in Honor of Charles F. Edson, ed. Dell, pp. 27-71, and his supplemental arguments in "Alexander the Great between Two Thrones and Heaven: Variations on an Old Theme," in Subject and Ruler: The Cult of the Ruling Power in Classical Antiquity, ed. Alastair Small, pp. 11-26 (Ann Arbor: University of Michigan Press, 1996). 30. The noted economist John Maynard Keynes considered Europe's plunder of the New World to be meager compared to Alexander's despoliation of Persia: see his A Treatise on Money, vol. 2 (New York: Harcourt, Brace, 1930), pp. 150-52, 291. 31. Frank Holt, Alexander the Great and Bactria: The Formation of a Greek Frontier in Central Asia (Leiden: Brill, 1988). 32. Arrian 3.30.5 and 4.7.3-4 (openly disturbed by the barbarity of Bessus's punishment); Diodorus 17.83.9; Curtius 7.5.40 and 7.10.10; Justin 12.5.11; and Plutarch Alex. 43.6. 33. Plutarch Mor. 341 F.
34. A.B. Bosworth, Alexander and the East: The Tragedy of Triumph (Oxford: Oxford University Press, 1996); Johannes Hahn, Alexander in Indien, 327-325 v. Chr. (Stuttgart: Jan Thorbecke, 2000). 35. From this battle stemmed the long obsession of the Greeks with elephant warfare: see, e.g., H.H. Scullard, The Elephant in the Greek and Roman World (Ithaca, N.Y.: Cornell University Press, 1974); F.E. Adcock, The Greek and Macedonian Art of War (Berkeley: University of California Press, 1957), pp. 54-56. 36. The classic exposition of this viewpoint is Ernst Badian, "Alexander the Great and the Loneliness of Power," Journal of the Australasian Universities Language and Literature Association 17 (1962): 80-91. 37. The diagnosis of this disease remains a major controversy among historians and medical experts. See, e.g., David Oldach et al., "A Mysterious Death," New England Journal of Medicine 338 (1998): 1764-68, and E. Borza and J. Reames-Zimmerman, "Some New Thoughts on the Death of Alexander the Great," Ancient World 31 (2000): 22-30. 38. English translations of these sources are available in various Loeb and Penguin editions; for Justin, see J.C. Yardley and Waldemar Heckel, eds., Justin: Epitome of the Philippic History of Pompeius Trogus: Books 11-12, Alexander the Great (Oxford: Clarendon Press, 1997). The Greek Alexander Romance is generally attributed to Pseudo-Callisthenes. 39. Leo, The History of Alexander's Battles: Historia de preliis, the J1 Version, trans. R. Telfryn Pritchard (Toronto: Pontifical Institute of Mediaeval Studies, 1992). 40. Richard Stoneman, ed., Legends of Alexander the Great (London: J.M. Dent; Rutland, Vt.: C.E. Tuttle, 1994), pp. 3-19. 41. George Cary, The Medieval Alexander (Cambridge: Cambridge University Press, 1956), p. 303. Ekkehard would not have known the Persian Iskandarnamah, in which a Muslim Alexander beheads Porus for refusing to accept Islam: Elizabeth Baynham, "Who Put the 'Romance' in the Alexander Romance? The Alexander Romances within Alexander Historiography," Ancient History Bulletin 9, 1 (1995): 1-13, esp. p. 11. 42. The standard reference is still Lionel Pearson, The Lost Histories of Alexander the Great (London: American Philological Association, 1960). English translations of these fragmentary works can be found in C.A. Robinson, Jr., The History of Alexander the Great (1953; reprint, Chicago: Ares, 1996), vol. 1. 44. The resulting similarities among these works has given rise to the term "Vulgate Tradition" to distinguish this sometimes harsh version of Alexander's character from the more sympathetic view of Arrian. Some scholars use the term pejoratively, as demonstrated below in chapter 5, but here "Vulgate" is used only as a familiar term of classification, not condemnation. 45. Elizabeth Baynham, Alexander the Great: The Unique History of Quintus Curtius (Ann Arbor: University of Michigan Press, 1998); Ada Cohen, The Alexander Mosaic: Stories of Victory and Defeat (Cambridge: Cambridge University Press, 1997). To all those who witnessed his extraordinary conquests, from Albania to India, Alexander the Great appeared invincible. How Alexander himself promoted this appearance—how he abetted the belief that he enjoyed divine favor and commanded even the forces of nature against his enemies—is the subject of Frank L. Holt's absorbing book. 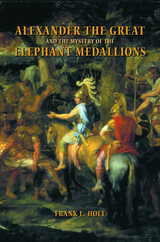 Solid evidence for the "supernaturalized" Alexander lies in a rare series of medallions that depict the triumphant young king at war against the elephants, archers, and chariots of Rajah Porus of India at the Battle of the Hydaspes River. Recovered from Afghanistan and Iraq in sensational and sometimes perilous circumstances, these ancient artifacts have long animated the modern historical debate about Alexander. Holt's book, the first devoted to the mystery of these ancient medallions, takes us into the history of their discovery and interpretation, into the knowable facts of their manufacture and meaning, and, ultimately, into the king's own psyche and his frightening theology of war. The result is a valuable analysis of Alexander history and myth, a vivid account of numismatics, and a spellbinding look into the age-old mechanics of megalomania. Frank L. Holt is Professor of History at the University of Houston. He is the author of Thundering Zeus: The Making of Hellenistic Bactria (California, 1999) and Alexander the Great and Bactria: The Formation of a Greek Frontier in Central Asia (1988) and editor of The Greeks in Bactria and India (1985). 4. Whose Pachyderm, Whole or Halved?